One report for each [Main demographic]. Summary questions are automatic groupings of questions of the same type from the same page, assumed to be a shared topic, as well as matrix questions. This style shows the values and distribution for each such summary. Useful for getting overview and detail next to each other for convenient analysis. Word outputs are formatted as two charts per page. Excel outputs have a tab for each topic or page. Web reports are continuous. 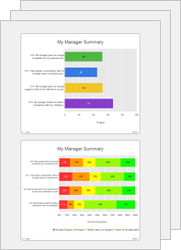 PowerPoint and PNG formats are single chart per page or slide. TIP: In a wide browser, or lower zoom, charts appear side by side.